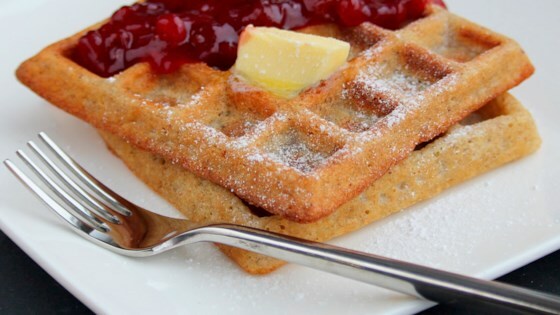 "During a wheat- and sugar-free time in my life, I created a recipe for some absolutely delicious waffles. They are easy to make and a breakfast the whole family could enjoy together." Mix rice flour, baking powder, and salt together in a bowl. Whisk milk, eggs, olive oil, and vanilla extract together in a separate bowl; add to rice flour mixture and whisk until no lumps remain. Let sit for 1 to 2 minutes. Pour batter into waffle iron, working in batches, and cook according to manufacturer's instructions.